'Tis the season for weddings, christenings and garden party gatherings, and as such I spent an aaaaaawfully long time a few weeks ago searching for something of a statement bag, to fill a gap in my current collection of very plain, simple leather clutches. I felt the need for one which was a bit more special, a bit more stand-out, whether in colour or sparkle or shape. And I felt quite drawn to the little, boxy kind which don't fit much in (so make sure that you wear a jacket with pockets or take your partner, for some extra carrying space). I went for this one in the end from ASOS, but these bags below also were in contention, and some of them are now in the sale - yes, summer sale time already! 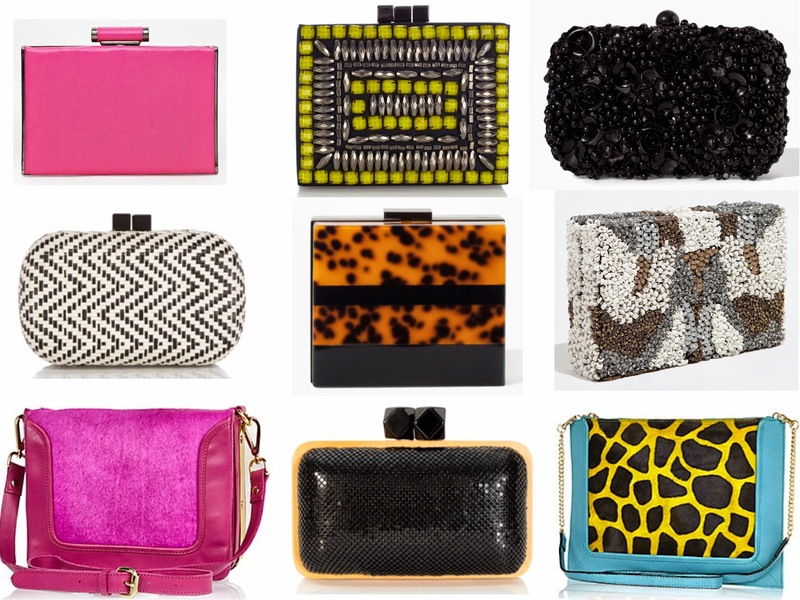 Brianna box clutch, £65 French Connection; Neon square bead clutch, £28 Coast; Beaded box clutch, £59.99 Zara. Margeurite clutch, £28 Coast; Tortoiseshell minaudière, £49.99 Zara; Beaded box clutch, £39.99 Zara. Bright pink leather pony skin cross body bag, £35 River Island; Woody clutch, £28 Coast; Turquoise leather giraffe cross body bag, £35 River Island.